OBSERVATION POST SHRINE, Afghanistan – I miss my dog, but I didn’t realize how much until I met Camo, an improvised explosive detection dog. This little position on a hill overlooking the Taliban-held area of Zamindawar is referred to as a “static ambush position,” so Camo doesn’t get much of a chance to do her thing up here. 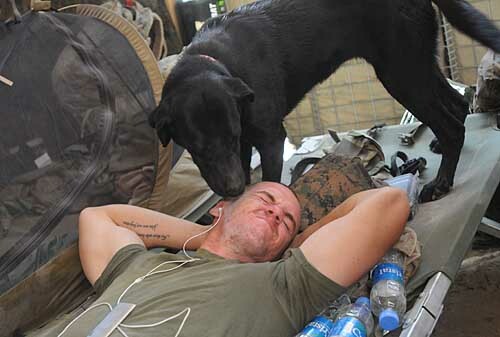 After sitting for hours at the feet of handler Lance Cpl. Richard Bissett as he stands post at one of the gun positions, Camo tears around the camp kicking up dust, sweeping water bottles of cots with her tail and getting lots of laughs from all the guys up here with her infectious energy. She’s permanently attached to Bissett’s side, except for frequent stops to get a little attention from other members of the squad. Bissett will have to turn Camo over to a new handler this summer when he returns to Camp Lejeune, N.C., but until then she’s spreading morale to Third Squad, Second Platoon, in Alpha Company, 1st Battalion, 8th Marines. Great photo James! This made my Friday.